I am always looking for work to increase my students ability to think and reason. 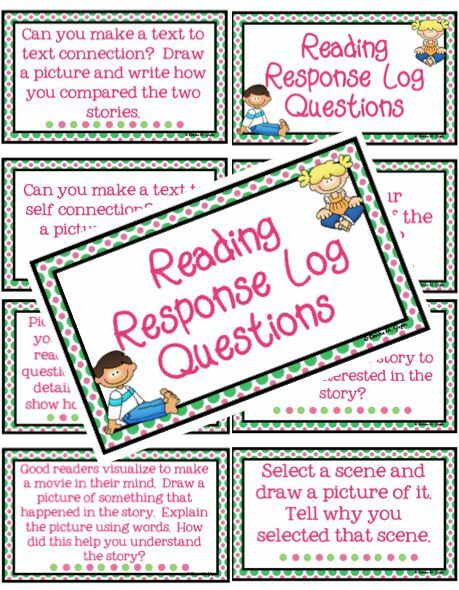 These are a little hard for my students to do in the beginning of the year but we do it anyway to get them thinking about their answers and teaching them how to go back to the text to support their reasons. 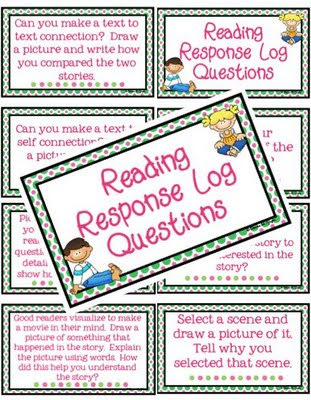 By the end of the year, the children can begin to write their answers in a Reading Response Journal. 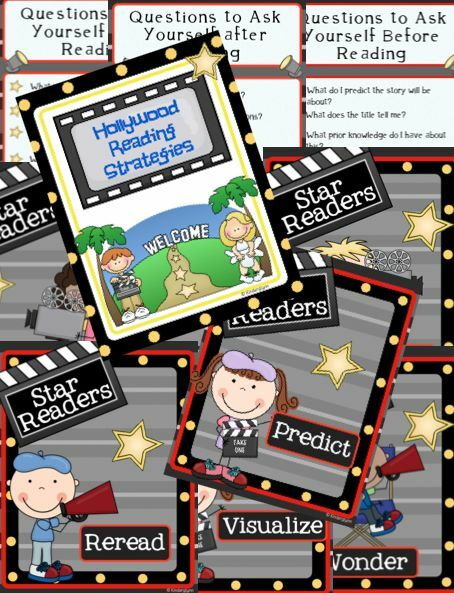 When the students become familiar with the questions and are able to discuss them in detail using examples from the story, it helps prepare them for the future and also for state testing. The kids love them. 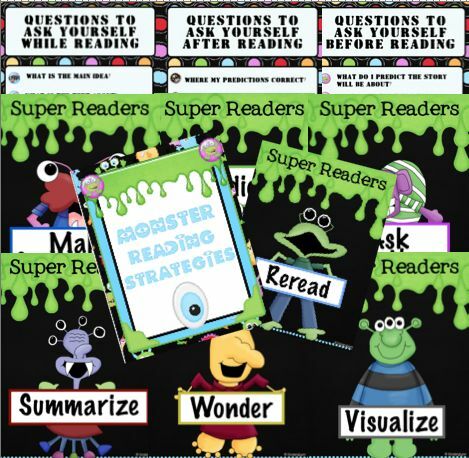 There are 25 Reading Response Questions, 10 sheets the children can use for recording their answers (2 sets of 5 one with lines and one with dotted lines) and a set of gray line masters that you can send home with the parents to help them support what their children are doing in school. This is a must have for the school year. 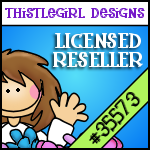 They are on sale now for $5.00! Don't miss out! It is me again, trying to catch up a little. Here are some freebies for everyone! I hope you all enjoy. I will catch up..... I will catch up..... I will catch up!!!! My name is Donna Glynn. (Kinderglynn) I am a mother of three beautiful children. 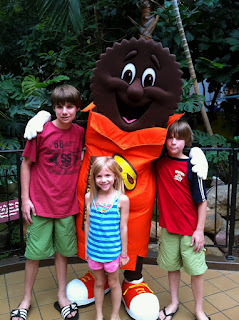 George 13, Anthony 11, and Ashley 7. They keep me on my toes! I have two dogs that also do a great job making me insane most days. I say that with so much love as Dudley, our lab just pushed past my husband and ran off. So Tom is now chasing after him. Dudley is getting more daring in his ventures to escape. Yesterday he took off up the hill, around the corner and up the other hill! Scary. Anyway, Dudley is our beautiful lab. We are very proud of him because he just lost 10 lbs. (He is doing much better than I am!) Now he only weighs 112! Charlie is our other dog. He is a Chesapeake, Chocolate, Husky mix. He only weighs about 65 lbs. Both are just the sweetest things. School started for me today and the kids come next Monday. I moved classroom this year and I love my new room even though it is smaller. For some reason it feels more like home. So once I decide where I am going to put everything and what bulletin board goes where I will be super excited! I have been teacher since 1993! I feel so old. My first teaching job was taking over a classroom in Philadelphia as the special ed 4th grade teacher! It was fun at the time, but I love my younger kids. I have also taught 3rd, 2nd and now Kindergarten. I love watching my students grow up. My last class of third graders graduated from High School this year. They are absolutely beautiful and I am so excited for them to start their new adventures in college. Personal: I did gymnastics most of my life and all through college. I loved it. It was a passion of mine and I got to meet so many wonderful people that I am still friends with. I am so happy my daughter now does gymnastics. Here is a video of when I was in college. 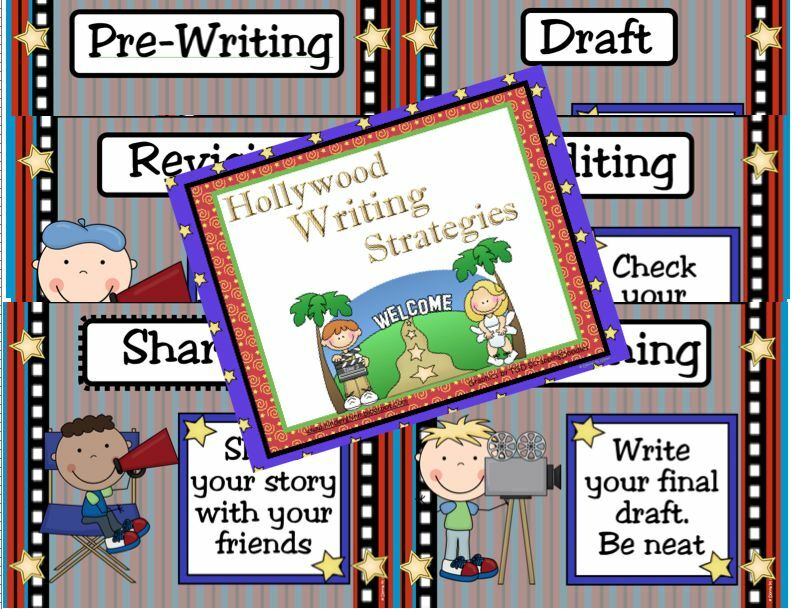 Teaching: That I absolutely love sharing ideas and will be forever grateful to all my blogging friends for all the support and help you give me. 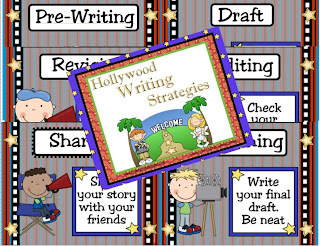 I can not wait to use all the wonderful ideas that I have seen this year to start my year! I also love presenting. I love to meet new people and make friends. It is one of my favorite things to do. What Teaching Supplies Can You Not Do Without? All of them! Can coffee also count as a teaching supply? 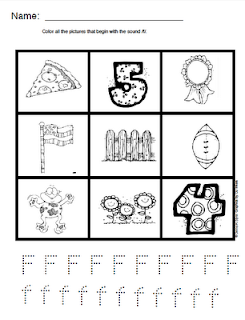 Here are two quick number sense activities that I created to use the first week of school. 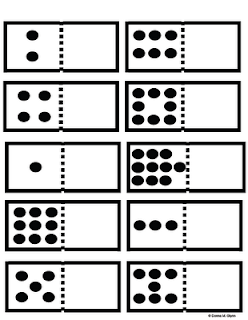 The children will just roll the dice and then practice writing the correct number. 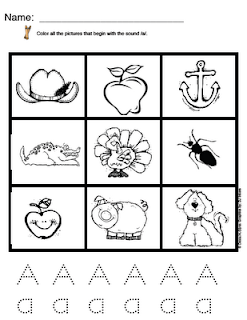 They will color the "X" or treasure chest at the top of the paper to see which number is the winner! Click here to get yours for free! Pirate Voices Freebie and the Start of a Theme! I am getting so excited to get into my room and start decorating. I can't wait to try out my new theme for this year....... PIRATES!! 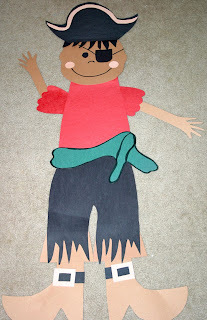 I made a pirate last night, he still needs some work, but I like the way he turned out and I saw the cutest stop light voice cues at the Learning Parade (see her post here) and knew I just had to do them in a Pirate Theme! Thank you Caroline for inspiring me. You totally rock! You can click here to get them for free. Please leave feedback if you download them!! 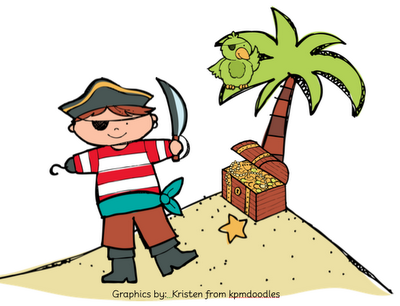 I was also inspired by Beg Borrow and Steal's post that I ran down to Michaels at 8:30 last night knowing they close at 9:00 and it takes 20 minutes to get there to buy the Pirate Wall Stickers but they didn't have them! I was so disappointed when I got in my car (thank goodness for my new iphone) that I looked up the number to our other Michaels and called them after store hours and to my surprise they answered the phone and the lady was so sweet she even went and looked for me, but they were sold out! (that was one long sentence!) So hopefully they will get some more in before school starts! I love them. 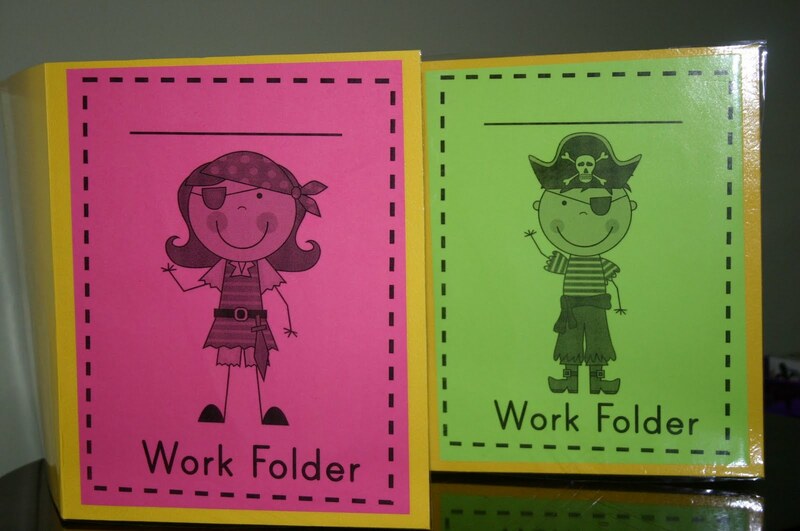 Here are my kids work folders. I decided this year to give the boys one and the girls one. 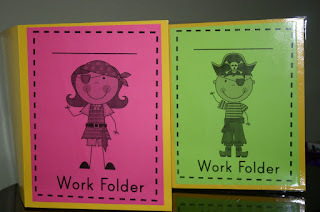 I have my Friday Folders done too, but I can't find them now! Oh no! I put them under something to help them lay flat after I laminated them, now I can't remember where I put them. I seriously would lose my head if it wasn't attached most days. I better get looking for those! I will post a picture when I find them. Well, summer is coming to a close and I am so sad, but excited to meet my new little ones. I wish I could keep this beautiful weather all year long. I am NOT a winter person at all! Give me 100 degree weather everyday and I would be SO happy. Time to get busy doing some things that need to get finished! This is one deal you do not want to miss today!! For today only the K-Crew who I totally love and have almost all their things is offering there Buzz Book which is usually 50.00 for only 5.00! This is fantastic. Don't wait go get it now! Also their daily deal for today is another great book they are offering for only 10.00 and it is Daily Graphs: Make a Choice. FANTASTIC!!! So much to do, so little time. Here is my Chester's Days in School unit for centers to use with the Kissing Hand. 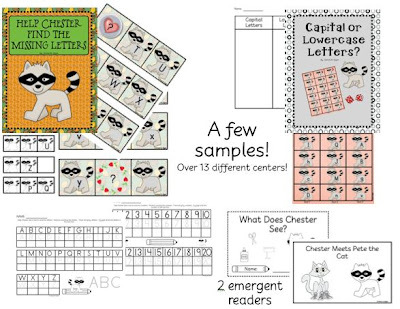 Also include, is a emergent reader about Chester Meeting Pete the Cat! so cute. One of my favorite things to do in the beginning of the year is to have my students believe that the classroom is magical and we all have magical abilities. 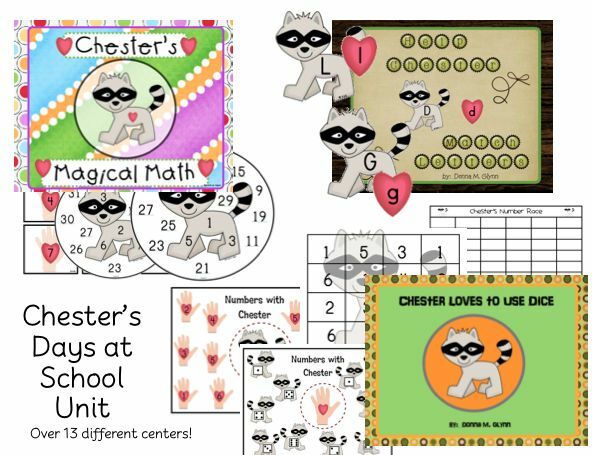 I have included in this unit a Chester Magical Math Wheel where the students pick a number and you will be able to guess their number every time! My students love it. 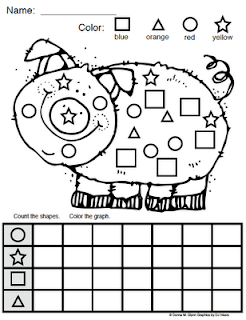 It is also a great transition activity to pull their attention back or just if you have a few minutes. 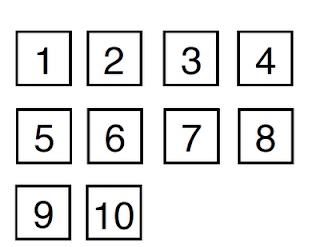 There are over 13 centers. Pick and choose the ones that are best for you or choose all of them!! Seuss, Western, Pirate, Hollywood and Monster. Also check out my Fire Safety unit for October. 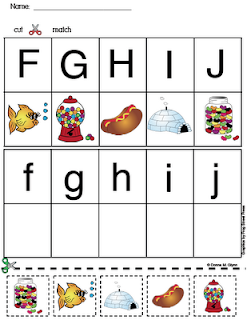 Lots of great centers to keep your little ones busy all month! 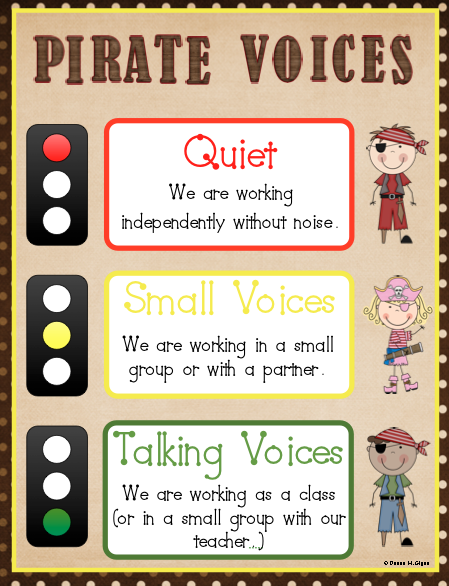 I added an odd an even sign to post in your classroom. And finally, if you have to post the Common Core Standards in your classroom these will be a great addition. These use the "vigor" of the verb when stated. I think that should keep you up to date. 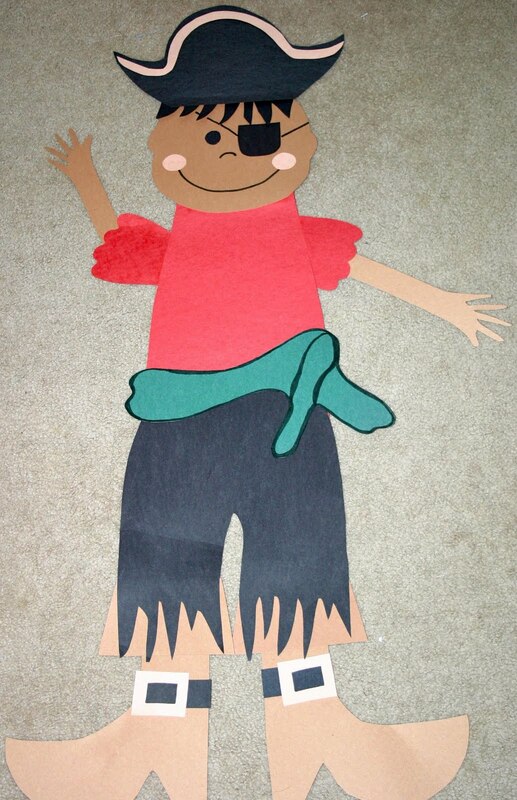 My friend Jennifer from Kinderpond also has posted some awesome things on TPT. 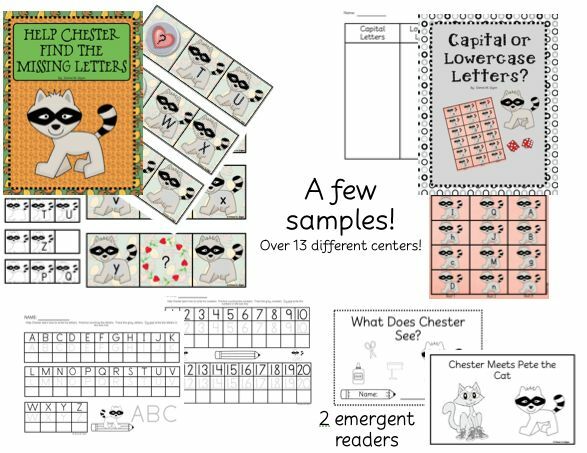 Check these out: School Supplies Pocket Chart, School Supplies Emergent Reader, School Supplies Student Color Book, and Student Supplies Big Book! Kristen from First Grade Teaching! If you did not win, don't be sad because you can still take advantage of their FREE 60 day trial and use the code 1006 for a BIG discount! This truly is the best assessment and time saving for my classroom. I feel like with all the testing we are accountable that it has cut my testing time in half and has given me the time to do what I really need to do ...... TEACH. 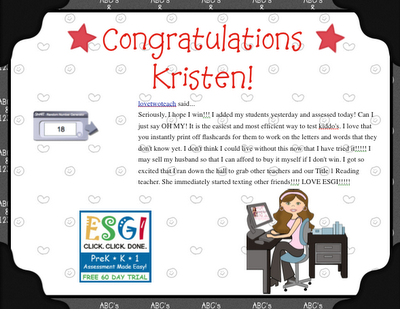 And I love that after I test, all I have to do is click a button and it prints the letter out to my parents to keep them informed on what their child was tested on and what they need more work on. I will never go back to paper and pencil again! Congratulations Kristen! Click here to learn more about ESGI! ESGI Giveaway Don't Forget to Enter! I wanted to remind everyone about the ESGI Giveaway! 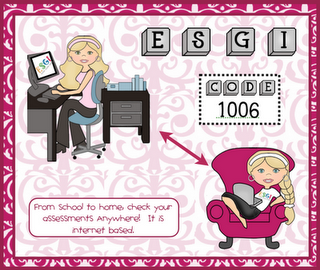 I use this assessment program every year and I absolutely love it. There are so many wonderful things which make this stand out! You can create your own tests to meet the needs of your students, or there are already pre-made tests that come with your subscription. 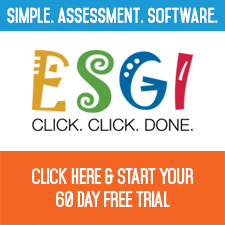 Also, anyone in your school or district that also has ESGI can link and share your tests so you do not have to reinvent the wheel. 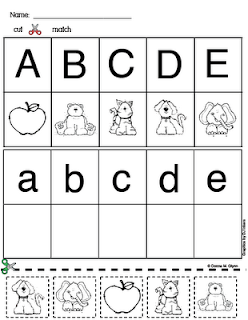 It prints individualized flash cards for each child with their name and date at the top. 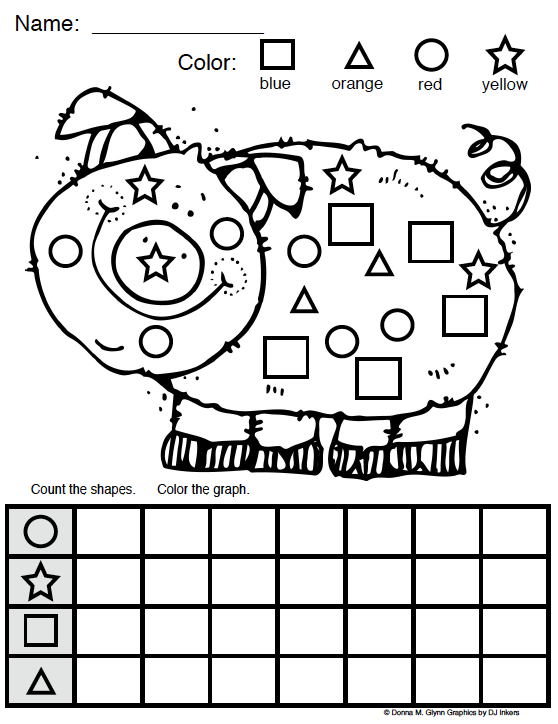 After you test, you can click on a bar graph or pie chart and see which children knew the concept and which did not! The parent letter is incredible. It really helps parents keep up to date on what is going on and being tested. 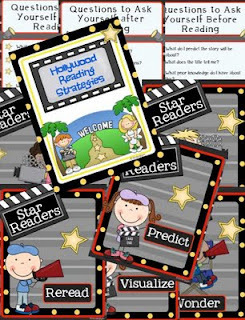 It helps them to see what their child did not know so they can study with them at home! It really makes one-on-one assessments easier and faster!It’s easy to get started by signing up for a FREE 60 Day Trial (no credit card needed). You’re going to love it! 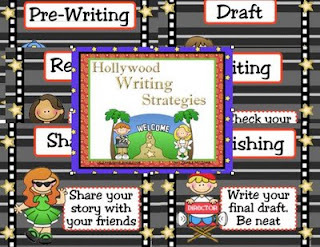 I bet you’ll never go back to paper/pencil assessments again. ESGI is offering a real treat. As we finish up the summer and head back into the classroom, One lucky reader will receive aFree One Year Subscription to ESGI (that’s a retail value of$199). Please click here to leave your comments. Sorry for the short post we are off to look at another dog. He is so adorable. I will let you know how it goes. I just posted these! 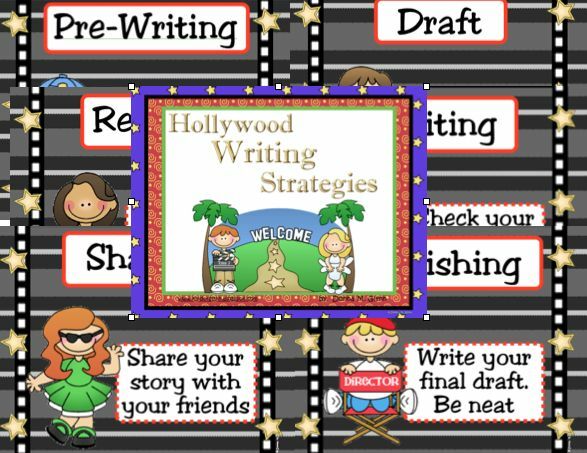 Hollywood and Monster Themed!